Golf flags usually indicate the hole number and location of the hole on the green, (front, middle, back). 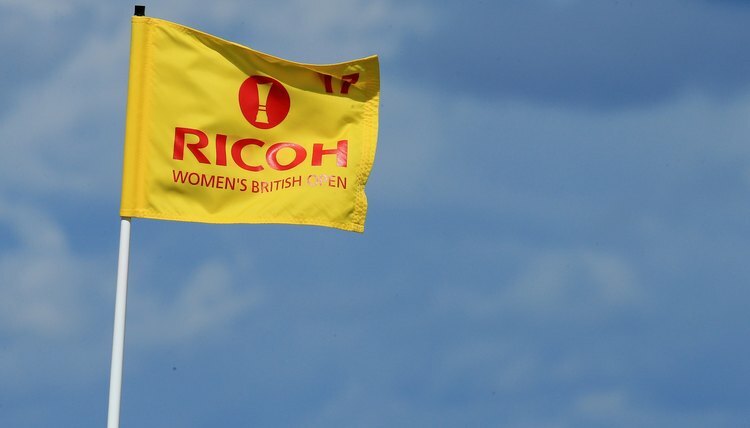 Flags, also known as pins, are an important part of golf. Used to denote where a hole is located on a green, a flag extends up several feet above the ground, ensuring that players on the course can locate the position of the hole on the green from several hundred yards out to best aim their approaches. Flag color is a method of telling golfers in the fairway or teebox the relative location of the pin on the green. Not all courses use color coding, so golfers are advised to inquire at the pro shop or examine the scorecards if they believe a course's flags to be color coded. When using color-coded flags, the color of the flag can be used to mark the location of the flag relative to the center of the green, with a color for front, a color for back and a color for center. Additionally, some courses mark relative distances to the hard, medium and easy areas of the green on the scorecard, and then use the color of the flag to denote which portion of the green the hole is cut in. Similar to using colors to denote the location or difficulty of the hole that has been cut on the green on a given day, some courses use smaller marker flags on the pin to denote hole location. The smaller flags are secured between movable anchors, often small foam washers, which allow the markers to be moved up and down the pin. The height of the marker flag on the pins shows where the hole is positioned. For example, a high marker might mean the hole is at the back of the green, while a low marker means a front cut. The flag's most important job is showing where the hole is for players that are too far away to see the hole. For this reason, there can be no penalty for striking a flag from distance, as it is important for the flag to be in the hole. As long as a player is taking a shot from off the green, and nobody is tending the flag during the shot, there is no penalty for a ball that is struck that hits the flag. Occasionally when shooting at a hole that has a flag in, the player will be dead-on target, and their ball will go at the hole. Sometimes in doing so, the ball can end up wedged between the lip of the hole and the pin. In these instances, players should take care when removing the flag, as it will determine their score. If the ball falls into the hole, it counts as in on the stroke that got it there. If the ball pops out, it is placed back on the lip, and must be tapped in for an additional stroke. While a player does not suffer penalty for striking an unattended flag from off the green, this does not hold true once the green is reached or if another player or caddy is tending the flag, or standing ready to pull it out. If a ball strikes the flag in such instances, the player is penalized two strokes for the violation. This can be assessed if the flag is in the hole when struck as well as if the flag has been laid down and an errant putt strikes it.